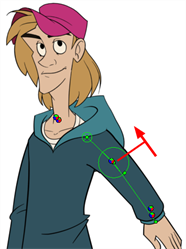 The controls to animate deformations work the same as those for setting up the chains. You simply need to create keyframes and position the control points. 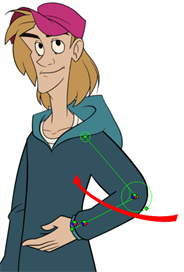 When adding new drawings while animating, you may need to see the reference drawings as their original resting position as it may be quite difficult to draw on a deformed canvas. 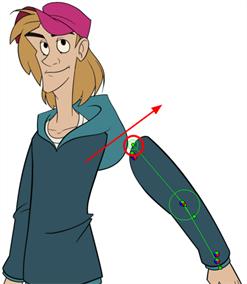 You have the possibility to disable the deformations to see the resting position while drawing. Note that this will not affect the exported images. It's only a display mode. You can see the result in OpenGL and Render modes in the Camera view, but the exported images will always be deformed. In the Timeline view, go the frame on which you want to create the first animation pose. If you want to create animation keyframes, enable the Animate mode in the Tools toolbar. 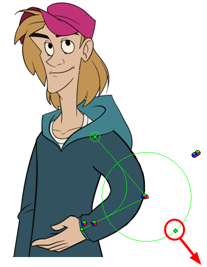 In the Timeline view, select the deformation nodes you want to animate—see Displaying the Deformation Controls. In the Timeline view, go the frame on which you want to set the next key pose. You will need to expend the exposure to see your drawings further down the Timeline view. In the Timeline or Node view, select the deformation group or node you want to reset. To completely reset the position and remove all keyframes on all frames, click on the Reset All Keyframes button. In the Timeline or Camera view, create or duplicate your new drawing. In the Deformation toolbar, enable or disable the Enable Deformations button, depending on your needs. 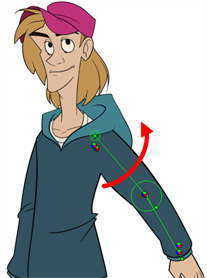 To continue animating, in the Deformation toolbar, reactivate the Enable Deformations button.